Clean & Clear Dual Action Moisturizer: This moisturizer has a great consistency and works smoothly into my skin. The moisturizer has no distinct smell, but does contain salicylic acid to help with acne. The moisturizer helped a couple spots clear up over night and didn’t feel heavy during the daytime application. Maybelline FIT Me! Dewy Foundation (Mocha): I’ve always wanted a dewy, glow from my foundation and this product does just that! The foundation gave great, buildable coverage that allowed me to cover any blemishes and dark spots. Even better, the foundation feels extremely light on my skin and did not seem to rub off! Maybelline FIT Me! Concealer (Cafe): This is my first try with concealer, so I will definitely need more practice. However, the concealer did help in creating a much better highlight and concealing my dark spots. Ulta Large Super Blend Sponge: I (sadly!) have always applied my foundation with my fingers. This led to some *interesting* blending and a struggle whenever I tried to build coverage. Using the sponge made my foundation application much easier, faster and perfectly blended. Overall, I’m very happy with my purchase and the price! 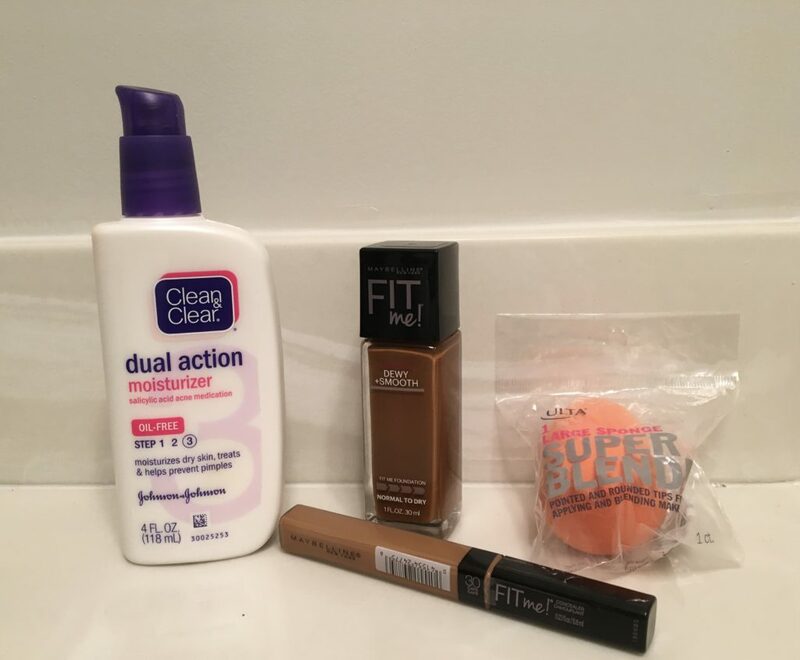 I shopped with a 20% off coupon and my Ulta points (No, this is not an ad – I just love Ulta!). Now to continue my progression of beauty and make-up skills!